Hello? It's me. Anyone still out there? ;) I have a HUGE backlog of blog posts that I would love to write, projects I am dying to share, recipes you must try and snippets of my growing boys that I want to preserve. But time is precious and short, so I'll do the best I can, just know my intentions are to be here more often than I really am. I always marvel at those that do daily, even weekly blog posts. I am better about instagramming, my account link here, but it's just not the same, is it? 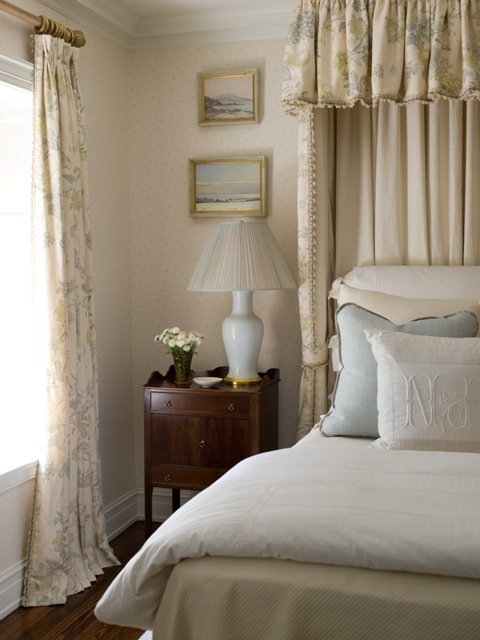 What we loved: The soft palette, the cornice and canopy, the timeless feel. 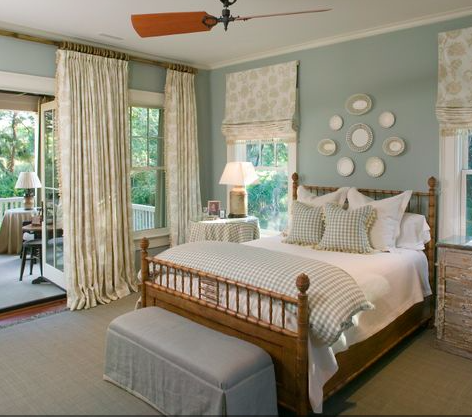 We decided to repeat the cornice and canopy idea for their master bedroom. 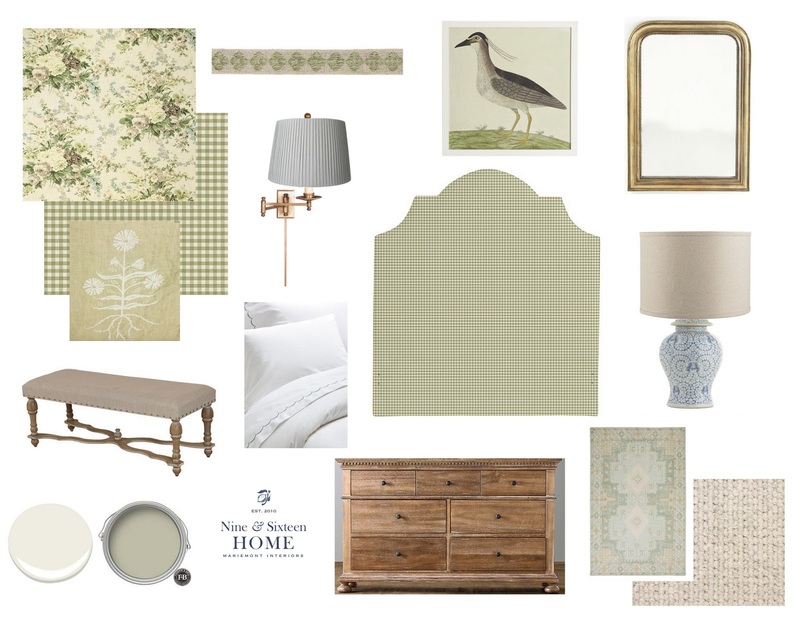 So here are the design boards for the room. 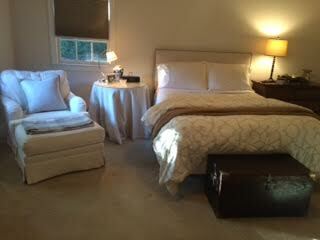 I provided two bed options, one to have an upholstered bed and the other to add bamboo. 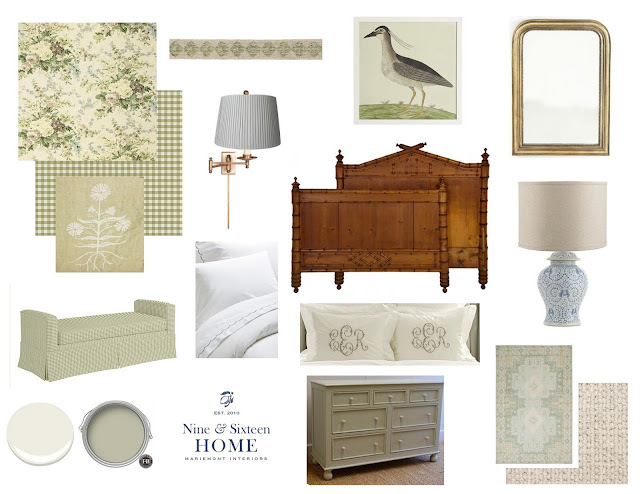 Note: More options for fabric, rugs, furniture, etc were provided as well as details on what to use where, these boards are intended to serve as inspiration and to provide a visual for how the suggestions will work together in a space. The color palette for the room is white, ivory, green and a touch of pale blue. I suggested lightening the walls to make everything feel a little fresher and more crisp. Also, upgrading to a lighter, small loop wool carpet. The pattern rug is for a foyer leading into the bedroom. I added the pretty block print fabric for a long bolster to make the bedding feel youthful, it would be trimmed in the same linen we would use on the custom swing arm lamp shades. I also provided both coordinating and contrasting trim options for the floral fabric that will go on the canopy and the windows. The bedding will be white, except for a very thin pale blue scallop and monogram. Liz has decided to go with the bamboo bed option, which I love, and just feels right for the room. I can't wait to see what she does with the plans - this is going to be a good one! You can find her here, at her blog. Out of respect to paying clients, I do not share sources for their plans. I'm always happy to share any sources in my own home. Thanks for understanding. A canopy - so fun! 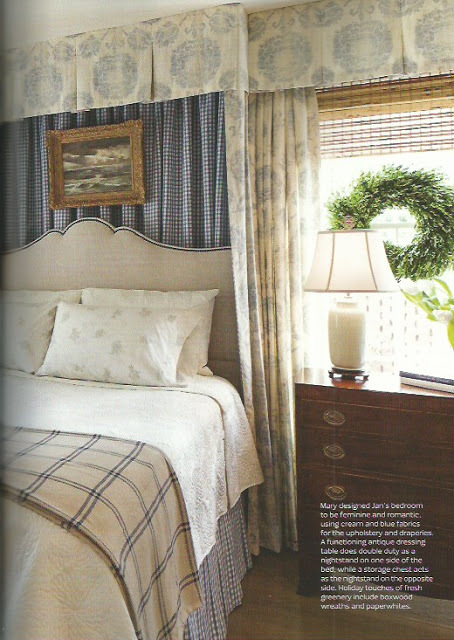 And I'm glad she chose the bamboo bed; love upholstered beds but the contrast of all that fabric plus the bamboo is just yummy! Can't wait to see it when it's done! And welcome back, you've been missed! We are so happy with our design plan! It will be beautiful and you are so wonderful to work with!! You make it so doable and give such great options to choose from! So glad you're design business has taken off and providing as much work as you want but I miss you blogging. It's great to hear from you! I look forward to both your Instagram and blog posts - I love seeing everything you are willing to share! This bedroom plan looks beautiful!! 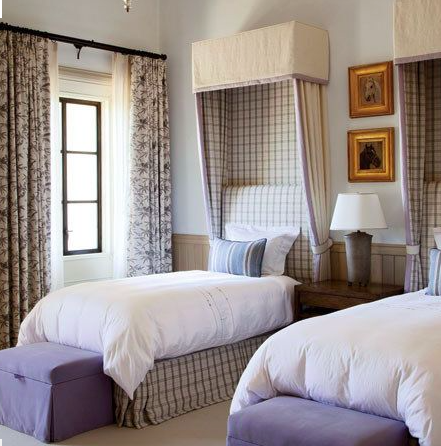 I love the bedroom with the small painting above the bed and the cornice, but the bamboo bed is wonderful too. Such pretty fabrics and furniture you've selected. I get so happy when I see a blog post email in my inbox. Love your style and the recipes you share. You are an inspiration!!! Perfectly perfect options - both are so pretty! Wondering if you might be able to share some sources for bedding?? Not this bedding per say, just bedding in general. What iI find in the stores is ,,,ugly! 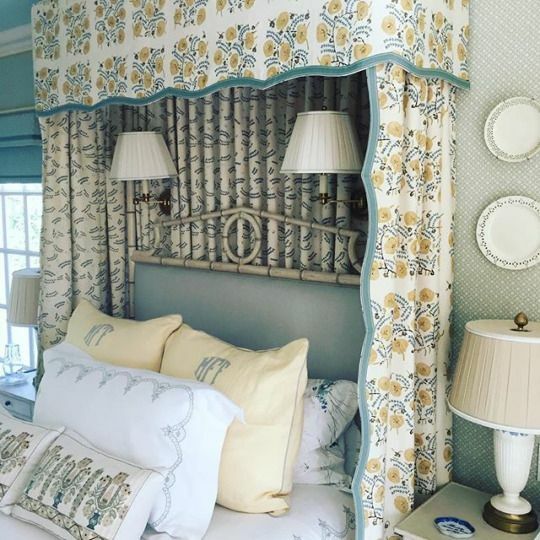 I'm not certain I want to go with custom bedding as it gets too spendy for my fickle nature :(, but I would love soureces for embroidered linens and smalll floral duvets ... or whatever! THanks!